Kubota is putting up a display booth at MEDLAB 2019 in Dubai soon! 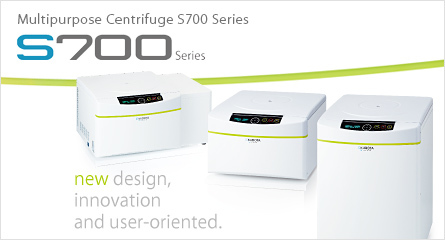 New Centrifuge, S700 series now on sale ! We have launched new S700 series centrifuge which was reborn with a completely new and innovative design. S700 series centrifuge was developed based on user perspective. It is a multipurpose centrifuge which has various features such as Mix loading, 3 short-cut key, colorful buckets etc. We have renewaled our website - it's more clean and easy to find the products you look for. Please inform us of any points of concern (spelling mistakes or omissions, broken links and other errors) that you notice regarding this website by clicking here. Any comments sent to us will be used for future reference. New Plate rotors, PF-206 & RMP-206 now on sale!! *RF-23 & RMP-23 has been descontinued and these rotors are the replacement. New buckets 053-4930, the replacement for 053-5850.